WHAT IF ... WE COULD WALK or BIKE TO A WEEKEND FARMERS MARKET DOWNTOWN (again)? 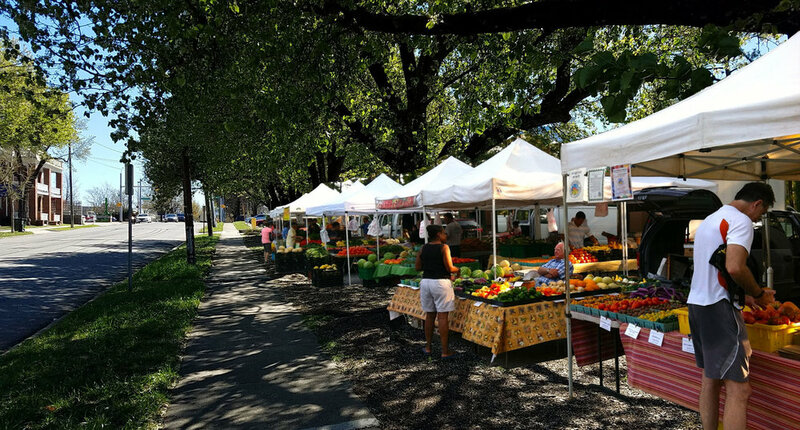 Wouldn’t it be great to walk to a Farmers Market downtown on the weekend? To shop outside for fresh local vegetables, grab a cup of coffee, breakfast perhaps, hang out and meet your neighbors? We can. There is a place of opportunity, a “missing tooth” between downtown and nearby walkable neighborhoods: the Person Street parking lot across from the Governor’s Mansion. Open to the public on weekends, this lot is rarely used. These state-owned lots serve government workers only during the week. … but we live here all the time. The lower, tree-lined corner of this lot, at Person and Jones streets, sits empty even during the week. Parking lots don’t have to be dead zones. We can use this precious urban real estate, transforming places for cars into places for people. A Pop-up Farmers Market will bring life to this sea of asphalt, linking downtown with Oakwood, Mordecai and neighborhoods beyond. And FREE off-street parking will never be a problem! 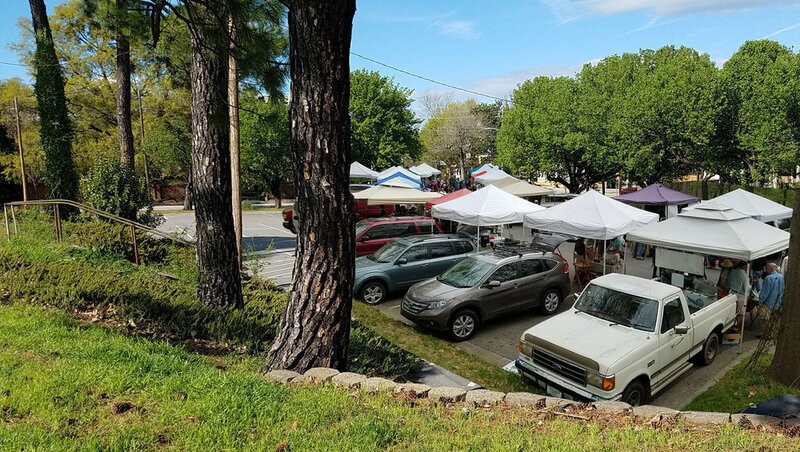 A farmers market is a community gathering place, a destination, a place for us to casually meet each other on foot, with food, dogs, children, even live music. A place of health and connection, it brings out the best in us and in our city. An open air market changes visitors’ perception of a city. It offers a glimpse of the local color of a place, its people, produce and farmers. There’s no reason to let these valuable urban lots sit idle. Let’s animate them. Let’s create a city full of “people places” wherever we can. And what a great snapshot of the breadth of our city: local neighbors and farmers right next to the Governor’s Mansion and State Legislature. Bottom-up and top-down, side-by-side. That’s a healthy city. A downtown Farmers Market is an old idea. We used to have one. It speaks to our agricultural past and to our local food culture future. But to embed it in our neighborhoods, not to isolate it by itself, and to offer it on weekends, makes all the difference. Or call Tina Govan at 919-641-0791. We are excited to hear from you, your interest and your ideas. Please share and spread the word!